We are amongst the reputed names in the market for delivering the finest collection of Led Exit Signs. The offered item is made with the help of innovative techniques for facilitating ultimate result to the clients. Steel New York City approved LED exit sign and emergency unit combo with LED heads. Ideal for hospitals, office buildings and schools. FHNY31: Combo unit, 20-GA steel, white housing, single face, red lettering, Ni-MH battery. Three 9.6V, 3W LED lamp heads. Usage: Office, Cinema Halls, etc. Our company is involved in manufacturing and supplying a wide array of Signage Boards. 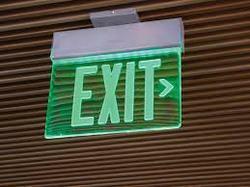 In our broad array, we offer LED Exit Sign that is based on LED technology. Our LED sign boards are appreciated for the elegant design, customized size and light weight.